In tropical South America originates a species of fish called the Oscar Fish. The Oscar Fish is from the Cichlid family. It is also known by a variety of other names, such as: Tiger Oscar, Velvet Cichlid, and Marble Cichlid. 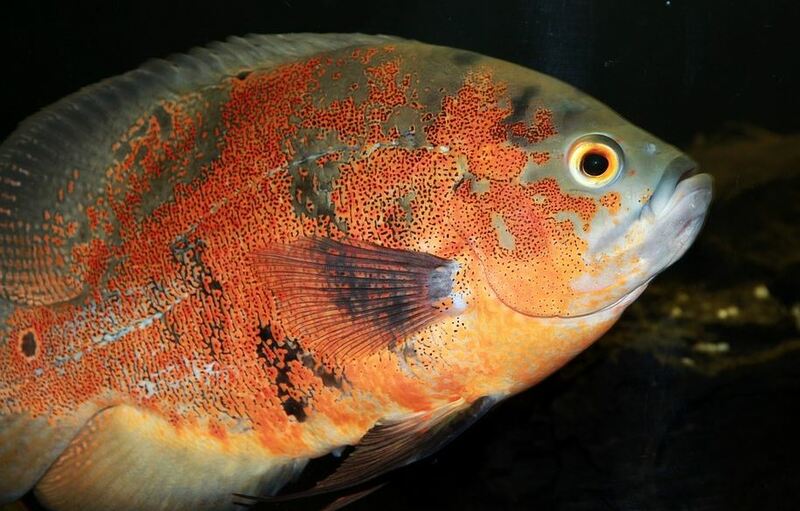 The Oscar Fish has an uncanny likeliness to the piranha, but is not related in any way. It is a fresh water fish and has a life span of 10 – 20 years. Do not get fooled by Oscars though. Even though they are cichlids they should only be kept with other Oscars and no other types of fish nor other cichlids. They definitely cannot be kept with discus fish nor neon tetras!! Looks can be deceiving when it comes to the Oscar fish. They are truly fascinating because of the unpredictability of their social habits; which can be mesmerizing and captivating for a home audience. They are extremely popular for their effervescent beauty and gracefulness when swimming; but can be very aggressive. Never the less, they have found favor with human-kind. •	They are highly domesticated; they often interact with owners and can even be trained to eat from their hand. They are considered to be highly intelligent and very sociable. •	They are playful in nature, often moving around items in their aquarium and have been known to shake their head or tail – these characteristics have earned them the name river dog, which makes them ideal pets. •	Aquarium should be set up to mimic their natural habitat. Therefore, one must consider the temperature of the fresh water rivers of the Amazon, which is warm. •	Install a filter to clean the tank and a heater to ensure that the appropriate temperature is always maintained to cater to the comfort of your little friend or friends. •	Use an appropriate size aquarium depending on the number of Oscar fishes you plan to accommodate in your tank. 50 gallons of water per Oscar is ideal. They require a lot of space as they are considered to be very territorial. They will attack each other if there is not enough space. Approximately 30 gallons of water should be enough for each Oscar Fish that is added to the tank. •	Furnish your fish tank with things such as: sand, small rocks and logwood. You can even design sturdy caves. Make sure that the decorations are fixed and not easily dislodged. Real plants are not ideal so use decorative ones. They can add a little flair to the overall design and appearance of your aquarium.